Zofia Wisniewska was born in Warsaw, Poland, on March 1, 1910. She received a Master’s in Law from the University of Warsaw in 1934. When WWII broke out, she was working in the Polish consulate in Bratislava, Slovakia, with her first husband, Wojciech Krzyzanowski. The German Military Administration allowed the consulate staff to move on to Romania, where many Polish war refugees congregated briefly. By 1940, she was in Lebanon working for the Polish Red Cross. In 1942, she became the Director of the Polish YMCA attached to the Polish Army in Palestine and Egypt. The organization served soldiers as well as children and youth who had reached the Middle East from the Soviet Union when that country joined the allies. 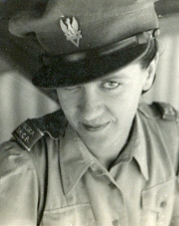 After the invasion of Italy, she became Deputy Director of the Polish YMCA attached to the Polish 2nd Corps in Italy (1944-1946). After the war, she briefly worked with the Polish YMCA in London. Her first marriage was annulled and she married Walter M. Drzewieniecki in Italy in 1945. When Drzewienieckis immigrated to North America, Zofia worked alongside her husband on their farms in Canada and the U.S. When her husband resumed his studies, she worked as an editor at the Polish weekly Gwiazda Polarna in Stevens Point, Wisconsin and then as head of the Post Office of the University of Chicago. When her husband finished his studies, Zofia re-started hers and received a M.S. in Library Science from Syracuse University in 1963. She was the head of Interlibrary Loans and Curator of the Polish Room Collection at Lockwood Library, State University of New York at Buffalo, from 1963 to 1969, and later a cataloger at Butler Library, Buffalo State College from 1969 to her retirement in 1971.